"This recipe was given to me many years ago by an elderly farmers wife and has been one of my 'must do' yearly canning recipes. If you have a large amount of beets, just keep repeating brine until your beets are all gone! Enjoy!" 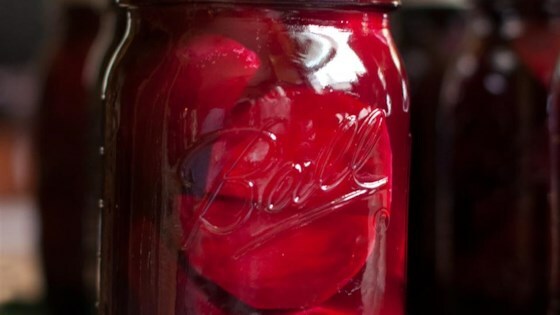 See how to turn fresh beets into homemade pickles. Beets were great. I've made them several times. The only change I made was to add some sliced red onion. There is way too much cloves in this recipe. You can hardly taste the beet, and it made my tongue numb. Needs more spices. I added cinnamon, ground the cloves and added them both to the hot brine. I also added sliced onions to the beets in the jars. We made this recipe and it turned out great. Very easy recipe to follow. The beets are delicious. Thanks! This recipe is just fine - no cinnamon or other spices - they are not spiced pickled beets, just pickled beets. Some people like to add onion, but not me or Juanita ever add onion. i was looking for a recipe that would compare to my grandmother's beets and this one comes close. very, very good! This recipe is super easy and the beets taste great! I added cinnamon to the mixture, and I'm glad I did. This was a great recipe for a "pickling" beginner. Great taste.